As stated earlier, some meteoroids survive their passage through Earth's atmosphere and land on the surface. In modern usage the term meteorite is broadly applied to similar objects that land on the surface of other comparatively large bodies. For instance, meteorite fragments have been found in samples returned from the Moon, and at least one meteorite has been identified on the surface of Mars by the robotic rover Opportunity. The largest meteorite that has been identified on Earth was found in 1920 in Namibia. Named the Hoba meteorite, it measures 2.7 metres (9 feet) across, is estimated to weigh nearly 60 tons, and is made of an alloy of iron and nickel. The smallest meteorites, called micrometeorites, range in size from a few hundred micrometres (^m) to as small as about 10 ^m (0.0004 inch) and come from the population of tiny particles that fill interplanetary space. The principal driving force behind meteorite studies is the fact that small bodies such as asteroids and comets are most likely to preserve evidence of events that took place in the early solar system. There are at least two reasons to expect that this is the case. First, when the solar system began to form, it was composed of gas and fine-grained dust. The assembly of planet-size bodies from this dust almost certainly involved the coming together of smaller objects to make successively larger ones, beginning with dust balls and ending, in the inner solar system, with the rocky, or terrestrial, planets— Mercury, Venus, Earth, and Mars. In the outer solar system the formation of Jupiter, Saturn, and the other giant planets is thought to have involved more than simple aggregation, but their moons—and comets—probably did form by this basic mechanism. Available evidence indicates that asteroids and comets are leftovers of the intermediate stages of the aggregation mechanism. They are therefore representative of bodies that formed quite early in the history of the solar system. Second, in the early solar system various processes were in operation that heated up solid bodies. 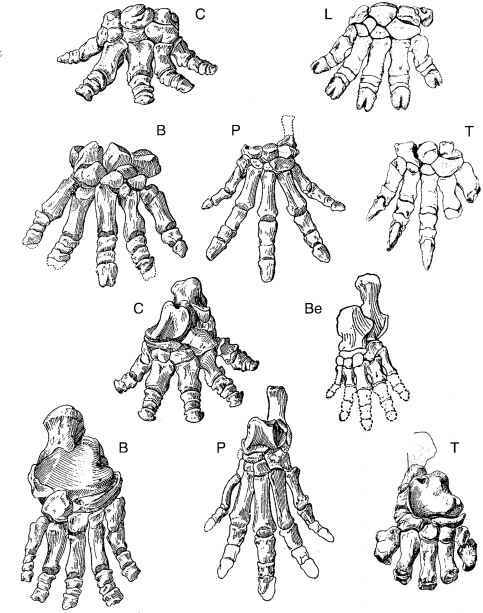 The primary ones were decay of short-lived radioactive isotopes within the bodies and collisions between the bodies as they grew. As a result, the interiors of larger bodies experienced substantial melting, with consequent physical and chemical changes to their constituents. Smaller bodies, on the other hand, generally radiated away this heat quite efficiently, which allowed their interiors to remain relatively cool. Consequently, they should preserve to some degree the dust and other material from which they formed. Indeed, certain meteorites do appear to preserve very ancient material, some of which predates the solar system. Meteorites traditionally are given the name of a geographic feature associated with the location where they are found. Until quite recently, there were no systematic efforts to recover them. This was largely because meteorites fall more or less uniformly over Earth's surface and because there was no obvious way to predict where they would fall or could be found. When a meteorite was seen to fall or when a person chanced upon an unusual-looking rock, the specimen was simply taken to a museum or a private collector. In the 1930s and '40s, enterprising meteorite collectors began crisscrossing the prairie regions of North America, asking farmers to bring them unusual rocks that they had found while plowing their fields. Prairie soil is largely derived from fine glacial loess and contains few large rocks. The collectors realized that there was a reasonable chance that any rocks the farmers unearthed would include meteorites. however, is to search places where they can accumulate over time—i.e., where the surface is quite old and rates of weathering are low. Because meteorites contain minerals, such as iron metal, that are easily weathered, they do not normally last long on Earth's surface. Liquid water is one of the principal agents of weathering. In desert environments, where there is little water, meteorites survive much longer. Indeed, they tend to accumulate on the surface in arid regions if weathering rates are slower than the rates at which meteorites fall to Earth, provided that little windblown sand accumulates to bury them. Areas of the Sahara in North Africa and the Nullarbor Plain region in Australia have proved to be good places to look for meteorites. The most-successful collection efforts, however, have been in Antarctica. The Antarctic can be viewed as a cold desert. Annual snowfall is quite low over most of the interior, and the intense cold slows weathering rates considerably. Most meteorites that fall on the ice sheet become buried and are stored for 20,000-30,000 years, although some appear to have been in Antarctica for a million years or more. The ice of the Antarctic sheet gradually flows radially from the South Pole northward toward the coast. In places, the ice encounters an obstruction, such as a buried hill, that forces it to flow upward. Strong katabatic winds, which sweep down the gently sloping ice sheets from the centre of the continent, sandblast the upwelling ice with snow and ice particles, eroding it at rates as high as 5-10 cm (2-4 inches) per year and leaving the meteorites stranded on the surface. Areas of upwell-ing ice, called blue ice for its colour, can be recognized from aerial or satellite photographs, and on foot the dark meteorites are relatively easy to spot against the ice and snow. The drawback of collecting in Antarctica is the harsh conditions that the collection teams must endure for weeks to months while camping out on the ice. Since the 1970s several countries, notably the United States and Japan, have operated scientific collection programs. Some tens of thousands of meteorites have been brought back from Antarctica by the two countries' programs, increasing the number of meteorites available to researchers manyfold. These include one-third of all known Martian meteorites, one-third of known lunar meteorites, and numerous other rare or unique samples. 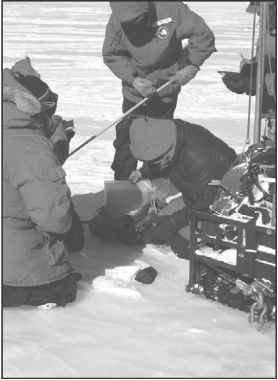 Because large numbers of Antarctic meteorites are found within small areas, the traditional geographic naming system is not used for them; rather, an identifier is made up of an abbreviated name of some local landmark plus a number that identifies the year of recovery and the specific sample.